Riley Elementary School hosted its annual fun fair on March 22nd. The event is a jam-packed family fun night that Riley Elementary goes all out every year with different games and mini adventures around the building. Holly Lyles, kindergarten teacher, and her friend Jamie Goodwin are two of people who lay the groundwork for such a fantastic event. The preparing starts all the way back to the end of November and early December. It takes around four to five months to acquire everything needed for the fun fair. When March rolls around, the teachers work overtime setting up donations, putting together baskets, and deciding where the games will be located throughout the school. Riley’s own families and students donate most of the items for the baskets that are able to be won by purchased raffle tickets. Riley gives each grade level an option of a theme to choose from and whichever theme wins, students and families are sent home with a list and are asked to donate whatever they can. If students bring in items for the fun fair baskets, they are awarded free tickets to the fun fair. Even though the Rockets’ families donate an immense amount of items, time, and effort making this event special, it wouldn’t be near as outstanding without the businesses all around Northwest Indiana that also contribute to the fun fair. Lyles spends a great deal of her time venturing from business to business in hopes of at least a couple companies being willing to donate, but it’s never as easy as it sounds. 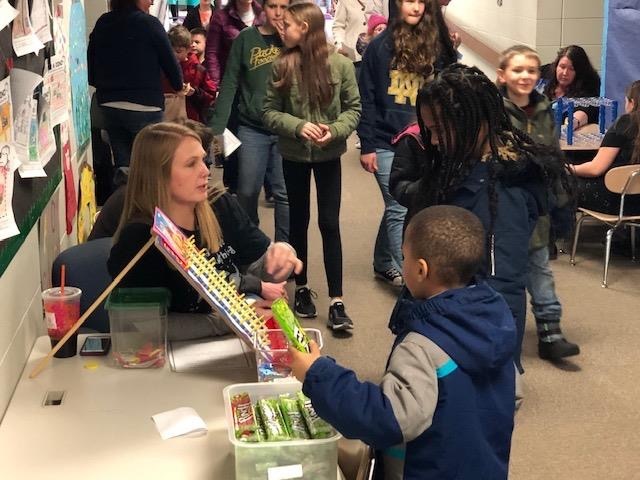 When the school sets an exact date for the spring fun fair, Lyles writes a donation request letter, which explains the event and asks the business for gift cards or product donations. After the communication is out to the local organizations, Lyles waits a few months for a response, and if she doesn’t hear back from the different places, she checks back to see if they are willing to donate. Lyles and her friend Jamie aren’t the only two that work hard. It’s a team effort, so many staff, families, and students help out with the event as much as they can. They also really enjoy being able to let loose and enjoy a night of fun. It’s safe to say that the Riley Elementary School fun fair was another successful night.